The fabulous Fire Station Inn located in the heart of Cosmopolitan North Adelaide with its huge selection of open air Cafes, restaurants and Hotels is a luxurious boutique style accommodation of three non-smoking suites. The Fire Engine Suite is a fully self contained,large open plan apartment. 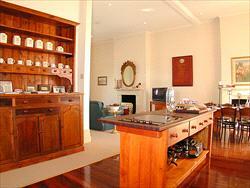 It offers a fully equipped kitchen, king bed, king size spa bathroom and his and hers lavatories. However the highlights of the Suite would have to be the life size, antique fire truck and original fire man?s pole in the bedroom! The Residency Penthouse is a superb 5 star spacious contemporary penthouse suite, restored & designed for our most discerning & VIP guests, of 5 rooms with a sundeck of 7 metres, perched two stories high. It features a two person spa marble tiled bathroom, huge open plan kitchen, dining and living areas. The master bedroom is lightly washed with a creamy rag finish and opens; via French doors, onto a balcony overlooking the North Adelaide Cafe precinct. The second master bedroom with French canopied half testa all Brass queen bed & single bed, opens on to the sundeck with designer wrought iron dining table & chairs. We offer complimentary secure car parking for the Residency Penthouse Apartment and Loggia Suite. There is street parking available for the Fire Engine Suite. ***North Adelaide Heritage Group maintains a strict no-noise policy and unauthorized parties, group gatherings and functions are strictly prohibited. Breach of this policy will result in the offending guests being required to leave the premises with no refund. Smoking is not permitted indoors. Should smoking occur within our accommodation a minimum charge of AUD$100 will be applied. ***North Adelaide Heritage Group wins Fodors Choice Award! *** Fodors Travel, the foremost name in travel publishing, has named the North Adelaide Heritage Group a 2009 Fodors Choice selection. This distinction recognizes a remarkable achievement for us, receiving this award for the 4th consecutive year!! As a 2009 Fodors Choice recipient the North Adelaide Heritage Group receives special recognition in Fodors guidebooks as currently being among the best in its field. 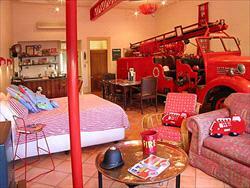 The FIRE ENGINE SUITE with its accompanying 1942 Fire Truck in the bedroom IS AUSTRALIAS MOST UNIQUE & EXTRAORDINARY ACCOMMODATION SUITE. With your Antique Red Fire Engine, Red Fireman Pole, Red Fireman Lights & many exciting Fireman accessories & paraphanlia, even Dress Up Uniforms for Photographs. Rate is for 2 adults in one queen bed, any extra persons is charged at the extra persons rate of A$62ea per adult and A$45ea per child. The LOGGIA LUXURY SPA SUITE is a private suite with the emphasis on Romance and privacy with touches of Baroque accents and burnished jarrah floors. The magnificent two person huge spa bathroom with marble tiles and heated spa is flooded with light with 2 complete walls of glass opaque tiles. The bathroom is surrounded by a walled private courtyard garden (the Loggia) with Italiate tiles, Tuscan hued walls, a lions head fountain and slim pencil pines. 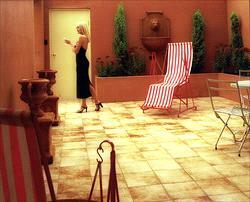 Our guests are provided with a stylish outdoor table and chairs and a comfortable sun lounge and shady umbrella. Rate is for 2 adults only in one queen bed. THE RESIDENCY PENTHOUSE with 2 Bedrooms is one of Adelaides most luxerious Penthouses with a whole top floor with views, 7 metre Sun Deck, Balconies and State of the Art Designer Kitchen and Spacious Living and Entertaining areas. Bedding Configuration is a luxury King, Antique Queen & 2 Leather Queen Sofa Beds. Rate is for 2 adults only in one king bed. Any extra persons is charged at the extra persons rate of A$119ea per adult and A$45ea per child.